Michelle Madow: A Mad Zombie Party by Gena Showalter Cover Reveal! 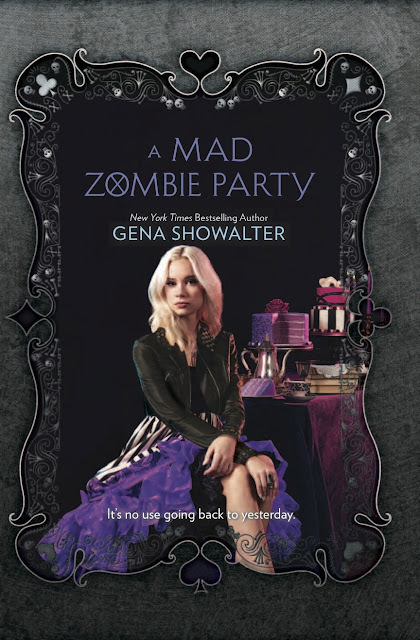 A Mad Zombie Party by Gena Showalter Cover Reveal! I'm excited to be able to share with all of you the cover to fellow Harlequin Teen author Gena Showalter's newest book in her White Rabbit Chronicles! Before I share the cover though, let me tell you a bit about A Mad Zombie Party, book #4 in the White Rabbit Chronicles. The battle rages on. Ali Bell and Cole Holland's crew of zombie slayers thought they'd won the war against Anima Industries, the evil company responsible for capturing and experimenting on zombies in an effort to discover the secret to immortality. In the last epic clash, the slayers lost many of their crew and closest friends. But Frosty, the ice man himself, has not recovered from one casualty in particular—the love of his life, Kat Parker. Other books in the White Rabbit Chronicles include Alice in Zombieland, Cole...Meet Ali, Through the Zombie Glass, and The Queen of Zombie Hearts. Be sure to check out all of these great books in Gena's series! And make sure you stop back on Friday when I will be offering one lucky winner a copy of Alice in Zombieland during my Free Book Friday Giveaway!